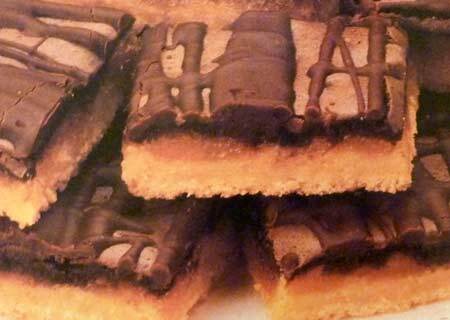 A nice and easy recipe for Chocolate Viennese Bars that begins with a fudge marble cake mix! These delicious bars taste just like something you'd find in an elegant European patisserie. The base of the cookie bars is cake mix so there's not a lot of measuring or mixing. The filling layer is a nice combination of dried apricot and almond flavoring and the bars are finished with a simple chocolate glaze. Your friends and family will think you've spent hours in the kitchen, but you'll soon see that's not necessary with this easy dessert recipe. If you live in an area of high altitude (above 3,500 feet) you will need to make a few adjustments. Just add 3 tablespoons of flour to the dry cake mix before mixing and follow the recipe. Bake the base at 375F degrees for 8 minutes and continue as directed, keeping the baking temperature at 375F degrees. In a large bowl, beat cake mix (reserve marble pouch), 1/3 cup butter and 1 egg with an electric mixer on low until crumbly. Reserve 1 cup of this mixture for chocolate layer. Press remaining mixture into prepared pan. Bake for 10 minutes; remove from oven and all to cool for 5 minutes. Meanwhile, in a small saucepan combine apricots and water and simmer for 5 minutes or until apricots are soft and most of water is absorbed. Spread apricot mixture evenly over base layer in pan. In same large bowl, combine contents of marble pouch, 1 cup reserved mixture, milk, almond extract and 1 egg on low speed until moistened. Continue to beat for 2 more minutes on high. Pour mixture evenly over apricot layer. Return pan to oven and bake 20 to 25 minutes or until top springs back when touched lightly in center. In a small saucepan, melt chocolate chips and 2 tablespoons butter over low heat, stirring constantly until well blended. Drizzle melted chocolate over bars and refrigerate so glaze will set.